Canaletto is undoubtedly the most outstanding of the 18th-century Venetian view painters.View paintings or vedute depicting panoramic views of the city and its surrounding areas depicted with topographical accuracy were highly prized by the travellers and art lovers who made the Grand Tour. This lengthy trip to France as well as Italy was an essential part of the education of many English aristocrats in the 18th century. Like other visitors to Italy, they considered these view paintings to provide the ideal record of their youthful adventure. The first view painters to record Venice in the 17th century were northern artists. They included the German painter Joseph Heintz who focused on the city’s celebrations, and the Dutch painter Gaspar van Wittel, known as Vanvitelli. The latter’s works influenced Luca Carlevarijs, the first Italian painter of topographical views, who focused on more everyday aspects of the city. Carlevarijs is considered the pioneering figure in this genre, introducing a more rigorous approach to the construction of his compositions. Both these canvases were in the Liechtenstein collection in Vienna, entering the Thyssen-Bornemisza collection two years apart in 1956 and 1958. In 1948, prior to their acquisition for the Collection, they were exhibited in Lucerne in an exhibition on the Liechtenstein collection. 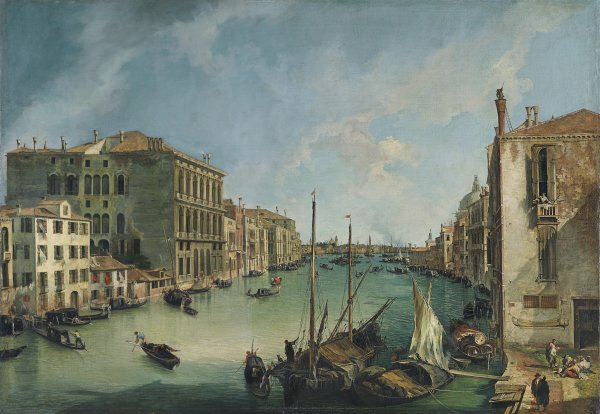 Art historians had previously shown interest in The Grand Canal from San Vio, Venice, which was included in Ferrari’s text of 1914 on Canaletto and Bellotto. Considered among the earliest known views by the artist, Canaletto depicts Venice’s most famous square from the viewpoint of the old church of San Geminiano (destroyed during the French occupation of the city in order to build the so-called Napoleonic Wing or Fabbrica Nuova, now occupied by the Museo Correr). The background is occupied by the façade of San Marco and part of the façade of the Doge’s Palace, with the impressive bulk of the belltower in front of it, breaking the horizontality of the background with its pronounced vertical. On either side, emphasising the pictorial recession are the Procuratie Vecchie on the left and the Procuratie Nuove on the right. The canvas already features some of the most notable characteristics of Canaletto’s style, including the choice of a high viewpoint to create the composition, the precision with which the buildings are depicted with all their ornamental details, and the painstaking depiction of the numerous elements that create the overall atmosphere of the work, all devices that can be considered among the innovations that the artist brought to this genre. Canaletto’s accuracy in depicting the buildings of Venice (albeit with some artistic licence) has enabled his canvases to be correctly dated. In the case of The Piazza San Marco in Venice the paving of the square is in the process of being replaced with a new one, which was undertaken between 1723 and 1734 and was designed by Andrea Tirali. In the present canvas the areas of paving nearest to the Procuratie are completed but the central element is unfinished. This central area would have a geometrical design, as can be seen in the canvas by Canaletto in the collection of the Duke of Bedford, dated to the following decade to the present one. The state of the piazza seen here corresponds to 1723 to 1724 and it is known that between 1725 and 1727 the decorative paving on either side to the central zone was completed. The subject of The Grand Canal from San Vio, Venice was depicted by the artist on a number of occasions. In the present case the view, looking towards San Marco, opens in the right foreground with the palazzo Barbarigo where we see a woman leaning out of one of the windows and a man cleaning one of the chimneys. The wall of the façade that gives onto the campo, in which the artist included a number of figures, is decorated with a drawing of a boat and an inscription. The line of buildings on the right bank of the canal leads the eye to the dome of the Salute and the Punta di Dogana. On the other side Canaletto depicts the palazzo Corner della Ca’Grande and ends at the Riva degli Schiavoni. Both the brushstroke and the treatment of light are similar in these two canvases, although The Grand Canal from San Vio, Venice perhaps reveals more interest in creating effects of chiaroscuro, which is particularly notable in the boats in the right foreground that help to lead the eye into the composition. Canaletto achieved fine effects of colour and its nuances, successfully conveying the tones of the water, whose greenish tint contrasts with the large area of blue sky. Both The Piazza San Marco in Venice and The Grand Canal from San Vio, Venice were part of a series that was formerly in the Liechtenstein collection, Vienna. Two canvases in the Ca’Rezzonico, Venice, were also part of that series.artist brought to this genre.